We’d love your help. Let us know what’s wrong with this preview of El Arte de Pensar by Rolf Dobelli. This book offers fifty two examples of calculation errors we all make in our professional and private lives, from errors that affect our sentimental relationships and / or self-esteem, to errors that harm our business performance. To ask other readers questions about El Arte de Pensar, please sign up. Some helpful observations but some very obvious home truths. Mildly entertaining but me thinks the author takes himself a tad too loftily! What say you? I need to read this book .what should I do? Mani Kandan simple buy and read it. Nice packaging and design may give this book an aura of credibility. They certainly worked; I skimmed a few pages of it and bought it, thinking I would learn important lessons that I wouldn't get from other books about critical thinking. Alas, that won't be the case since the book reads like bull in a china shop; Dobelli massacres the art of critical thinking and puts in its place a Frankenstein doppelganger called cynicism and uncritical use of anecdotes. Let's take for example: Lesson# 19 "The Nice packaging and design may give this book an aura of credibility. They certainly worked; I skimmed a few pages of it and bought it, thinking I would learn important lessons that I wouldn't get from other books about critical thinking. Alas, that won't be the case since the book reads like bull in a china shop; Dobelli massacres the art of critical thinking and puts in its place a Frankenstein doppelganger called cynicism and uncritical use of anecdotes. Let's take for example: Lesson# 19 "The Dubious Efficacy of Doctors, Consultants and Psychotherapist: Regression to Mean" in which Dobelli includes anecdotes about an investment adviser at a major bank who does 'rain dance' whenever his stocks performed badly. The anecdote claims that "things always improve afterwards". Then, Dobelli juxtaposes that anecdote to the one about a young handicap-12 golfer who would book time with an instructor to improve his game. This time, Dobelli doesn't mention any mumbo-jumbo thing the golfer does so we can safely assume that the golfer did try to learn new techniques or improve upon his weaknesses so he can play better. Then, he put in other details for the chapter and wraps it all under 'regression to mean'. Well, really? "Rain Dance" claimed to "always" work comes under "regression to mean" and is considered similar to people practicing and improving their skills through hard work? I mean, sure, the adviser's behavior is an example of 'cognitive bias' but does it really come under that category (rather than one of the other 98 in the book)? The reading of this book will produce a sort of gut-feeling nausea that usually tell you something is wrong. Sure enough, you'll find plenty of 'not quite right' details in the book such as the use of anecdotes that don't fall in the right categories, the lack of footnotes, and critical analysis of the anecdotes. There's also the strange section of "A Note on Sources" that neither Dobelli nor his editor and agent bother to weave into the chapters as properly written end notes. Then, comes the interspersing of critically right and critically wrong information in each chapter; this book is the 'Da Vinci Code' of books on critical thinking. The book seems credible and right but it's neither. It's even more frustrating when I think I've spent CAD$16.99 on someone's sloppily written personal-notes-turned-into-commercially-sold book. Readers will get more out of books on the basics of critical thinking rather than this one. In fact, the book is dangerous since it "poisons the well" on so many subjects it fails to critically discuss about. The only usefulness of this book is in challenging readers to use their critical thinking skills to identify its biases and fallacies. The Art of Thinking Clearly is a 2013 book by the Swiss writer Rolf Dobelli which describes in short chapters 99 of the most common thinking errors - ranging from cognitive biases to elements like envy and social distortions. It can be useful as a starting point for a list of cognitive biases. However, it is mere plagarism of other texts. Dobelli uses examples taken directly from other sources, changes the names of characters and wording slightly, and uses them as if they were his own. Why not just quote from the original text? Also, some of his examples are so diluted and simplified that they are actually WRONG. One of the most glaring ones is his water treatment example for "Neglect of Probability". A: redu PLAGARISM. Also, some of his examples are so diluted and simplified that they are actually WRONG. One of the most glaring ones is his water treatment example for "Neglect of Probability". A: reduces probability of contamination from 5% to 2%. B: reduces probability of contamination from 1% to 0%. He says that method A is 3 times as good!!! HUH?!?! Method B removes 100% of the contamination..... that's a pretty good option right there. My advice is to take the chapter headings of the book as a list. Then go through the sources listed... you will get 100x more understanding by reading Cialdini, Munger, Taleb, Kahneman. 2- کتاب حاوی بسیاری از خطاهای شناختی است که برای کاهش این خطاها ارزش مطالعه چندینباره را دارد. اینکه چه تصمیماتی اشتباه است، چرا نباید چنین تصمیماتی را اتخاذ کنیم و چگونه درست عمل کنیم. 2- کتاب حاوی بسیاری از خطاهای شناختی است که برای کاهش این خطاها ارزش مطالعه چندین‌باره را دارد. اینکه چه تصمیماتی اشتباه است، چرا نباید چنین تصمیماتی را اتخاذ کنیم و چگونه درست عمل کنیم. 4- این کتاب را نباید همانند رمان در سه روز مطالعه کنید. باید انتهای هر فصل (هر فصل 3 صفحه است)، توقف و برای مدتی به آن فکر کنید. (انگار که دارید تمرین مسئله‌ای را حل می‌کنید.) پیشنهاد من مطالعه‌ی روزی 3 فصل است. 6- درنهایت این موضوع که قاعدتا یکی از دلایل فروش بالای این کتاب در ایران، نام و امضای «عادل فردوسی‌پور» به عنوان مترجم، نشان‌دهنده آن است که اگر افراد معروف دست به ترجمه کتابهای خوب بزنند چقدر می‌توانند در جامعه موثر واقع شوند. (3) Calamity of Conformity - If you ever find yourself in a tight unanimous group, you must speak your mind, even if your team does not like it, even if it means risking expulsion from the warm nest. And if you lead a group, appoint someone as devil's advocate. He or she will not be the most popular member of the team, but definitely the most important. (4) Induction - Send an email to 10,000 people with stock market prediction by dividing them into 2 groups - telling reverse prediction to each group. Prediction for one of the groups will come true. Send a new prediction to the 5,000 whom you predicted correctly earlier - again after dividing them into 2 groups...carry on like this, and the last 100 would consider you as a genius. People get inducted into a decision based on history without thinking logically. (5) Loss Aversion - The fear of losing something motivates people more than the prospect of gaining something of equal value. (7) It is not what you say, but how you say, that's important. 98% Fat Free product seems more healthy than a product with 1% Fat. (8) If you are not a part of the solution, you are definitely a part of the problem. There is no 3rd category of passive onlookers. (10) Whenever you are dealing with averages, be careful of the distribution behind it. A Bill Gates monthly income in a group of 50 ordinary citizens can give an extremely misleading average. (11) Money does not always motivate. It works as a motivation only in companies where employees work for only money. (12) Money comes wrapped in emotions. Monet won incidentally, as against earned through hard work, is more likely to be spent erratically - though it is illogical because the money is the same. This can be prevented if you have a clear financial plan with you. (13) Self Control drains your energy, and therefore you need a lot of energy if you want to exercise self control. (14) Presence of something is more noticeable and valued than its absence. e.g. presence of disease than its absence. OR getting off a plane and not noticing that it did not crash. در ابتدا باید بگویم که اگر شما این کتاب را به خاطر دیدن اسم "عادل فردوسی پور" بر روی جلد خریده اید دچار "خطای شناختی" شده اید! از آن خطاهایی که قصد این کتاب جلوگیری از آن هاست. شما فردوسی پور را به عنوان گزارشگری خوب و معروف می شناسید و این خوب بودن را به دیگر امور از جمله "مترجمی" او تعمیم می دهید! در حالی که لزومی ندارد کسی که در یک کار خوب است در بقیه ی کارها هم خوب باشد! بنابراین بیشتر افراد این کتاب را بر اساس معیاری می خرند که بنا بر خود کتاب اشتباه است. در ادامه ترجمه ی بد این کتاب را نقد می کنم. این کتاب شاید برای کتابخوانان ایرانی مطالب تازه و جالبی داشته باشد. اما در این باره کتاب های بسیار بهتری توسط دانشمندان پیشتاز این حوزه نوشته شده و این کتاب صرفا خلاصه ی فهرست وار و نسبتا ناشیانه ای از آن کتاب هاست. گرچه آن کتاب ها عموما ترجمه نشده اند و از بخت بد ما این کتاب هم با ترجمه یی ناقص چاپ شده. میاحث کتاب گرچه جالب هستند اما نویسنده آن ها را بصورت فهرست وار خلاصه کرده و در آن ها عمیق نمی شود. ترجمه ی این کتاب نسبتا ناشیانه و پراشکال است. و نشاندهنده ی ناآشنایی مترجمان با مباحث کتاب است. را در همان صفحه ی اول "خطاهای اساسی" ترجمه کرده اند که چیز دیگری است. اشتباهات ترجمه یی و نگارشی و ویرایشی چنان زیاد است که قابل شمارش نیست. جدا باعث تاسف است که ناشری معروف چنین ترجمه ی ناقصی را بیشتر به قصد سودجویی چاپ می کند و عده ی زیادی هم به خاطر اسم روی جلد کتاب آن را می خرند. . This book is the dead tree equivalent of a BuzzFeed post. Its title could be “I Got 99 Cognitive Biases But a Psychology Degree Ain’t One.” Or maybe not. Rolf Dobelli enumerates 99 thinking errors, or cognitive biases, in The Art of Thinking Clearly, dispensing as he does tips for leading a more rational, less error-prone life. Anyone who has done even the least amount of reading in this subject will recognize many of the cognitive biases that Dobelli describes here. Unlike most popular cognitive This book is the dead tree equivalent of a BuzzFeed post. Its title could be “I Got 99 Cognitive Biases But a Psychology Degree Ain’t One.” Or maybe not. 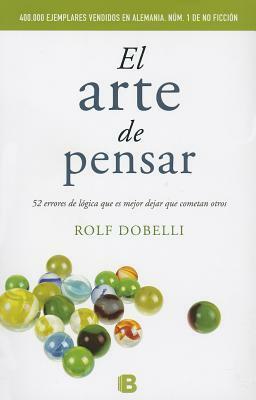 Rolf Dobelli enumerates 99 thinking errors, or cognitive biases, in The Art of Thinking Clearly, dispensing as he does tips for leading a more rational, less error-prone life. Anyone who has done even the least amount of reading in this subject will recognize many of the cognitive biases that Dobelli describes here. Unlike most popular cognitive psychology books, however, this book makes no central argument and does not examine these biases within a larger context. It is literally just a list, with extended descriptions, of the biases. At times, Dobelli occasionally ascribes the bias to some evolutionary origins, and he will quite often cite some interesting experiments conducted by psychologists (he is not, by the way) that revealed or provided insight into the bias in question. In his introduction Dobelli explains that the book began life as a personal list kept for his own benefit, and I can believe that. Dobelli covers 99 biases in 300 pages, so he can’t spend much time on each bias. Not every bias is as interesting or worthwhile as the next. But from the very beginning, I was frustrated by the brevity of each chapter. Just as I read something that intrigued me, Dobelli shepherded me on to the next bias like some kind of frantic tour guide worried that we won’t have time to see all of the art. Please stay with the tour, no cameras. I wanted to be mollified by dazzling prose, but I had to settle for somewhat dull attempts at wit. I wanted to be satisfied with lucid, if too concise, explanations of these biases, but I had to settle for somewhat tepid attempts to demonstrate these biases without getting drawn into the bigger discussions of the cognitive and behavioural science that underlies them. Dobelli ties his own hands here, to poor effect. To be fair, it is clear that Dobelli is well-read in this field. He has done his research (even if the “note on sources” section frustratingly places the sources under headings by the bias name but not the chapter number, and there is nary an endnote to be seen). It’s clear, judging from the number of times he quotes from or references Thinking, Fast and Slow, that he has been heavily influenced by the work of Daniel Kahneman. In fact, one could say that The Art of Thinking Clearly is little more than attempt to distil the biases and only the biases mentioned in Thinking, Fast and Slow and similar such books. The thing about blog posts like this is that they seldom linger in one’s short- or long-term memories. They are space-filling exercises, attempts to get eyeballs to the page and clicks on ads. It doesn’t work well in book form; I don’t, as a general rule, enjoy books of lists all that much. There are some exceptions for lists compiled and enumerated in a hilarious manner, but that isn’t the case here. Yet with the cognitive biases removed from a larger context and reduced merely to a checklist of errors to avoid, Dobelli robs them of their greater meaning. So if you’re truly interested in this subject matter, why not just skip The Art of Thinking Clearly and go read Thinking, Fast and Slow? I have. It’s much better than this book and much more informative, and it’s written by an actual psychologist. This book, like the BuzzFeed post it resembles, is a pale imitation of something more meaningful and accomplished. Imitation flowers have their place, but life is too short to waste it on imitation books. به درد افرادی میخورد که عمیق ترین کتابی که خوندن "راز" ه. حرف جدیدی نداشت بگم وای چقدر وقت گذاشتنش بهم اضافه کرد!!! If you're looking for a book to help you get ahead, or improve you as a human being, don't look here; but if like me, you want to see how a book of such reputation with no scientific ground, or even much common sense, can be so popular among some people, get this book and start reading. The fact that this is a terrible book became known to me very early in the book, however I decided to keep read If you're looking for a book to help you get ahead, or improve you as a human being, don't look here; but if like me, you want to see how a book of such reputation with no scientific ground, or even much common sense, can be so popular among some people, get this book and start reading. The fact that this is a terrible book became known to me very early in the book, however I decided to keep reading and finish the book, mainly for this reason, plus interest in some of the short stories in there. One thing that this book had for me, was a short list of some useful books to get to once I'm done with this one. 1. My main issue is the writer himself, read a few of the pages, and you soon come to understand that Rolf Dobelli doesn't know what he's talking about at all. He doesn't have any new knowledge to offer, and he doesn't even offer a better way to understand already known knowledge, regardless of how much he tries. 2. Cynicism is present all over the book, while that might be nice for a pessimist, it definitely isn't for an optimist like me, not even for non-pessimists all over the world. I could understand this if that cynicism was at the very least standing on some facts, but even that is not the case. 4. Lots of the data in the book is incorrect, and gladly we have math and science to back us up on this. My biggest question at these points was, "How this guy can be an investor, and work with money, if he doesn't even understand simplest statistics, and how someone must use math?" 5. And probably the most clear one to every reader, the writer is a hypocrite. He uses at least half a dozen of methods that he explicitly "orders" you (yes, "order", not "suggest" or "recommend") not to use ever. While this is clear at some points in the book, unfortunately some people find a way to overlook it. I could refer to 40 or 45 pages specifically and show you the problems I had with this book in details, but then no one would read this review, and so this couldn't help anyone avoid it, or be clear enough before reading it, so I decided to just point to a few generic and major issues, and not talk too specifically here. Why I didn't rate the book 1 star then? Well, the book has a list of errors, 99 to be exact, and while I don't agree with about half of them, the list can still be useful for you, maybe you can't get the required information for each error in this mostly stolen book, but it gives you a starting point to follow from other books, like Daniel Kahneman's book, and start using those points in your life. Just make sure you apply that final step before changing anything in your life based on this book. The book also had a couple of interesting short stories and pointers that I could use as clues and find more about later on. I wrote all of them on a small piece of paper and will get to at some point. I guess you have 2 options if you're interested in this book, first of all, you could read the full book, but close off your mind and make sure you don't treat this pile of information as correct until you spent quite some time filtering it; and secondly, you could just look at the list of topics at the beginning of the book and see which ones you can agree with at that very moment, and then jump to the end of the book and check the resources, and start reading the resources instead of the book itself to get to those interesting topics; after all, the writer didn't have anything useful to add here. I personally don't see the time I put to read this book as wasted, in fact I see it as investment into better filter wrong info in my journey, and also to understand better, the people that base their life on such books, as I believe I can do that a little bit better than before I started reading this. کتابی شامل99خطا که با ذکر مثال ها وجود این نوع خطاها رو در زندگیمون به ما ثابت میکرد.اوایل کتاب بیشتر جذاب بودن چون خیلی از خطاهاش برام ملموس تر بودن.مثلِ خطای تأیید اجتماعی که مسلماً درگیرش هستیم و هرچقدر افراد زیادی کاری، رفتاری و یا تفکر بخصوصی رو داشته باشن ما هم به ناگزیر سمتش میریم که علتش همین خطای تأیید احتماعی هست. زمانیکه هی به انجام دادن کاری اصرار میکنیم درحالیکه میدونیم اشتباه هست و داریم به خودمون ضرر میرسونیم فقط و فقط بخاطرِ اینکه نمیتونیم قبول کنیم که با شروع این کارِ اشتباه، زما کتابی شامل99خطا که با ذکر مثال ها وجود این نوع خطاها رو در زندگیمون به ما ثابت میکرد.اوایل کتاب بیشتر جذاب بودن چون خیلی از خطاهاش برام ملموس تر بودن.مثلِ خطای تأیید اجتماعی که مسلماً درگیرش هستیم و هرچقدر افراد زیادی کاری، رفتاری و یا تفکر بخصوصی رو داشته باشن ما هم به ناگزیر سمتش میریم که علتش همین خطای تأیید احتماعی هست. زمانیکه هی به انجام دادن کاری اصرار میکنیم درحالیکه میدونیم اشتباه هست و داریم به خودمون ضرر میرسونیم فقط و فقط بخاطرِ اینکه نمیتونیم قبول کنیم که با شروع این کارِ اشتباه، زمان رو از دست دادیم؛ این نوع رفتارِ ما بخاطر "خطای هزینه هدر رفته"هست. گاهاً خیلی خوش بینانه رفتار میکنیم و هی به خودمون میگیم "همه چیز درست خواهد شد! "غافل از اینکه باید این رو هم در نظر داشته باشیم"قبل از اینکه اوضاع بهتر شود، بدتر هم ممکن است بشود"
امّا به نظرم مهم ترین خطا"توهم کنترل"هست.با اینکه ما هیچ اراده ای روی چیزی نداریم حداقلش اگرم داشته باشیم خیلی کم اراده داریم ولی عین افرادی خودشیفته رفتار میکنیم و فکر میکنیم همه چیز تحت اختیارماست.این نوع خطا رو هر روز شاید در زندگی از طرفِ اطرافیانمون مشاهده میکنیم. و خطاهای ِ بیشمار دیگه ای که بعضی هاشون برام غیر قابل درک بودن و بعضاً هم خیلی خیلی قابل درک و بنظرم مشکلات عمده ما ایرانیان قشنگ تو این کتاب آورده شده!! رولف هیچ راهکاری نمیده که چطور این خطاهارو برطرف کنیم بیشتر سعی میکنه بگه چنین خطاهایی وجود خارجی داره!در داستان یه خطا هم مربوط به 1984جورج اورول بود و بقول ایشون"بعضی ها کم خطا هستن ولی بعضی دیگر کم خطا تر"
I bought this book just because I saw Taleb eulogizing the book right on the book cover and so I fell for it. If you have read The Black Swan, The Impact of the Highly Improbable by Nassim Nicholas Taleb then I would strongly re-commend do NOT go for the book but if you haven’t dipped into the ocean of Taleb’s thoughts then this book is for you. More or less, The Art of Thinking Clearly harps on the same line of thoughts, as is the case with Black Swan. Each chapter in the former case is like bu I bought this book just because I saw Taleb eulogizing the book right on the book cover and so I fell for it. If you have read The Black Swan, The Impact of the Highly Improbable by Nassim Nicholas Taleb then I would strongly re-commend do NOT go for the book but if you haven’t dipped into the ocean of Taleb’s thoughts then this book is for you. More or less, The Art of Thinking Clearly harps on the same line of thoughts, as is the case with Black Swan. Each chapter in the former case is like bullet points of latter’s approach. Both talks about reverse engineering of thought process, counter-intuitiveness and randomness. The book is a database of brief explanations of occurrences. It is quite a light read but I personally don’t think it can help anybody with decision making. The book surfaces things that are already present in everybody’s mind and some of them even have recognized them without reading the book even but had it actually helped anyone in decision-making, I am still doubtful. In one of his chapters, he talks about the inability of humans to comprehend probabilities well, I completely differ with this opinion of his. People do take probabilities into consideration, I mean, there are major chunk of individuals who see life as grey and not only black or only white. For these many people, there is always a space called the benefit of doubt and they leave it open while dealing with people around them whether in office or in life as a whole. I am a person with an average intelligence yet I feel this book is far from satiating my intellectual appetite. I love books that make me think even when am not reading but this international best seller is not for me. جواب میکل آنژ این بود: ساده است. هر چیزی را که داوود نبود تراشیدم . تمام سعی کتاب، نشان دادن نقاط تراشیدنی برای مردم عادی ست. از این رو لذت مطالعه ی کتاب ، چقدر که مقاطعی حوصله سر بر داشته ، اجتناب ناپذیر بوده . من أمتع وأروع ما قرأت في الفترة الأخيرة. إنه ذلك النوع من الكتب الذي لا تعرف معه معنى للملل ولن تفلته من يدك حتى تفرغ منه بالكامل، وعندها ستندم على إنهائه بسرعة وتتمنى لو كان أطول بكثير. إن كنت ممن قرأ كتاب "المغالطات المنطقية" للدكتور عادل مصطفى، أو كتاب "حجج فاسدة تجعلنا نبدو أغبياء" للكاتب والفيلسوف البريطاني جوليان باجيني أو نحوها من الكتب التي تتحدث عن أخطاء ومغالطات التفكير في حياتنا اليومية، فهذا الكتاب ينصح به بشدة وربما يكون من أمتع وأسلس القراءات في هذا المجال. مؤلف الكتاب هو صحفي وروائي من أمتع وأروع ما قرأت في الفترة الأخيرة. إنه ذلك النوع من الكتب الذي لا تعرف معه معنى للملل ولن تفلته من يدك حتى تفرغ منه بالكامل، وعندها ستندم على إنهائه بسرعة وتتمنى لو كان أطول بكثير. مؤلف الكتاب هو صحفي وروائي ورجل أعمال سويسري يدعى رولف دوبلي. ينطلق المؤلف من خبرته في مجال إدارة الأعمال والتسويق ليلخص لنا في هذا الكتاب 52 خطأً ومغالطة نرتكبها في تفكيرنا اليومي وتفضي بنا إلى اتخاذ قرارات خاطئة قد تكون لها عواقب وخيمة. إن كانت الكتب التي ذكرتها أعلاه تركز على المغالطات كأساليب في الجدل والخداع وتضليل الناس وهزيمة الخصوم فإن هذا الكتاب يركز على المغالطات كأخطاء منهجية نتورط فيها ونرتكبها أثناء تفكيرنا في شؤوننا الخاصة ومحاولتنا اتخاذ القرار المناسب وذلك بشكل غير واعٍ، ويركز على تلك الأخطاء الممنهجة أي التي نرتكبها بشكل متكرر وشائع. إنها تلك الطرق غير العقلانية في التفكير التي تسيطر على أذهاننا، وحين نتأملها بإمعان وهدوء نكتشف كم كنا غير عقلانيين وعبثيين تماماً في تفكيرنا! ميزة الكتاب بساطة الأسلوب وسهولة اللغة ووضوح الأمثلة، إلى جانب أنه يزخر بقصص وأمثلة طريفة ومسلية ستجعلك تبتسم في العديد من المواضع ما يجعله قراءة شيقة وممتعة. لا يستخدم الكاتب أية رموز ومصطلحات منطقية ورياضية معقدة وإنما يعبر عن أفكاره بأسلوب السرد السلس والواضح. الملفت أنه يحاول تفسير سبب ارتكابنا للعديد من أخطاء التفكير الشائعة ويعيدها إلى جذورها القديمة في حياة الإنسان البدائي وكيف كان لها دور مهم في حياة البشرية في ذلك الوقت ثم ورثناها عن أسلافنا وبقيت عالقة في تفكيرنا حتى اليوم رغم انتفاء الحاجة لها. يأتي الكاتب من خلفية بروتستانتية ذات نفس إلحادي ويميل لإبعاد الدين عن التأثير في الحياة وعدم الإيمان بالغيبيات وتقديس العقلانية، ولذلك سيختلف معه القارئ حتماً في بعض الأفكار المتعلقة بالدين لكنها تأتي في مواضع قليلة في الكتاب، أما آراؤه الأخرى المتعلقة بالجانب الاستثماري والاقتصادي فهي بلا شك مفيدة ومهمة لحد كبير. يبدو كذلك أن الكاتب من معتنقي نظرية التطور حيث يستخدمها كثيراً في تفسير منشأ بعض المغالطات في التفكير، ولأكون أكثر دقة فهي ليست نظرية التطور الداروينية بل ما يسمى بعلم النفس التطوري. FYI: I won this book from goodreads Giveaways, but that in no way influenced my review. The Art of Thinking Clearly presents a bunch of anecdotal evidence to support commonly known fallacies in logical thinking. You know that hindsight is 20/20, we cling to our narratives, and think we'll be like the models in makeup ads if only we buy their product, plus a bunch of other semi-obvious ways in which we end up making bad decisions (or poorly rationalized flukes that still turn out okay). This book FYI: I won this book from goodreads Giveaways, but that in no way influenced my review. The Art of Thinking Clearly presents a bunch of anecdotal evidence to support commonly known fallacies in logical thinking. You know that hindsight is 20/20, we cling to our narratives, and think we'll be like the models in makeup ads if only we buy their product, plus a bunch of other semi-obvious ways in which we end up making bad decisions (or poorly rationalized flukes that still turn out okay). This book *might* be the reminder you need to think critically about what assumptions and misconceptions you are basing your decisions on. However, if you're already a critical thinker you probably won't learn too much from this book. Also, it doesn't really seem academically researched enough to be otherwise worthwhile. If it was more humorous it would at least make the obviousness more palatable. کتاب خیلی کلی ای بود ؛ ولی به نظرم دید خیلی خوبی به آدم میده .فکر میکنم هر فصل کتاب خیلی جای بحث داره به طور جداگانه و به خاطر همین به نظرم کلی بود والبته تقریبا کافی و به همراه مثال های خیلی خوب. "اگر پنجاه میلیون نفر چیز احمقانه ای بگویند، آن چیز کماکان احمقانه است "
رولف دوبلی در کتاب هنر شفاف اندیشیدن با کلامی صریح، ساده و عامهپسند به بیان و بررسی خطاهای شناختی انسان که مانع از شفافاندیشی در زندگی میشنود پرداخته است. مسلما نمیشود همهی این خطاها را آنالیز کرد و از وقوع آنها پیشگیری کرد،همانطور که در خود کتاب هم مطرح شده، اما شناختن این خطاها و آگاهی از وجودشان اعتمادبهنفسی تازه برای اندیشیدن میبخشد. ترجمه کتاب هم بسیار روان و عالی است و سبب درک بهتر و روانتر مطالب میشود. رولف دوبلی در کتاب هنر شفاف اندیشیدن با کلامی صریح، ساده و عامه‌پسند به بیان و بررسی خطاهای شناختی انسان که مانع از شفاف‌اندیشی در زندگی می‌شنود پرداخته است. مسلما نمی‌شود همه‌ی این خطاها را آنالیز کرد و از وقوع آن‌ها پیشگیری کرد،همان‌طور که در خود کتاب هم مطرح شده، اما شناختن این خطاها و آگاهی از وجودشان اعتمادبه‌نفسی تازه برای اندیشیدن می‌بخشد. برای من خوب بود، یادآوری و اشاره به نکاتی بود که احتمالا خودمم میدونستم و قبولش داشتم، اما یا فراموش کرده بودم یا اهمیت و تاثیرش رو جدی نگرفته بودم. شاید بشه گفت بیشتر یادآوری بود تا آموزش! کلا کتاب سعی داشت بگه ازین روند غلطی که بهش عادت کردیم فاصله بگیریم و روش فکر و رفتار و به طور کل زندگی رو اصلاح کنیم. اما خب همونطور که خود نویسنده هم توی یکی از نکات اشاره کرده بود عملی کردن دانسته ها توی زندگی کار ساده ای نیست. خصوصا که عادت هم باهاش قاطی شده باشه. برخلاف خیلی از دوستان که به اعتبار و اسم فرد برای من خوب بود، یادآوری و اشاره به نکاتی بود که احتمالا خودمم میدونستم و قبولش داشتم، اما یا فراموش کرده بودم یا اهمیت و تاثیرش رو جدی نگرفته بودم. برخلاف خیلی از دوستان که به اعتبار و اسم فردوسی پور که مترجمشه کتابو خریدن، برای من وسوسه کننده نبود! دو سال پیش دوستی به من پیشنهادش کرد اما من خوندن کتابهای ادبی رو ترجیح میدادم، تا اینکه امسال بالاخره خوندمش و از خوندنش هم راضیم. کاش همون دوسال پیش میخوندمش. متنش خیلی روونه و کلا کتاب سبکیه خیلی زود پیش میره. چون موردی هم هست، میشه زمین گذاشتش و دوباره شروع کردش. من مواردی رو برای خودم، چه برای شغل و حرفه و چه کارای روزمره و عادی، علامت زدم. It's a PLAGIARIZED anthology of cognitive errors. The biases it presents are, mostly, well summarized from a series of books from Taleb, Ariely, Kahneman and others(which, as shown by Taleb in the link, Dobelli used without permission). The author made no research on any of the items, but merely put forward the work of others. He does say so in the beginning, that his book comprises of research from other people, but it doesn't absolve him of copying. Other than that, I consider it a good mix of It's a PLAGIARIZED anthology of cognitive errors. The biases it presents are, mostly, well summarized from a series of books from Taleb, Ariely, Kahneman and others(which, as shown by Taleb in the link, Dobelli used without permission). The author made no research on any of the items, but merely put forward the work of others. He does say so in the beginning, that his book comprises of research from other people, but it doesn't absolve him of copying. اين كتاب سيصد صفحه اي كه توسط "رولف دوبلي" نويسنده و كارآفرين سويسي نگاشته شده در واقع از ٩٩ متن كوتاه در مورد خطاهاي فكري و شناختي و تاثير محيط و تبليغات بر افكار انسان تشكيل شده است. هر يك از اين متن ها با مثال هايي ملموس در آغاز نوشته شروع شده و در ادامه به توضيح مطلب پرداخته است. در اين اثر ميزان محدوديت اراده و خواست انسان، اثر پاداش ها و تنبيه هاي محيطي، طيف عظيم تبليغات جهاني و تاثير آن بر برداشت ها و افكار انسان در زندگي شخصي و اجتماعي به زبان ساده توصيف شدهاست. نكته ي قابل توجه ديگر در اين اين كتاب سيصد صفحه اي كه توسط "رولف دوبلي" نويسنده و كارآفرين سويسي نگاشته شده در واقع از ٩٩ متن كوتاه در مورد خطاهاي فكري و شناختي و تاثير محيط و تبليغات بر افكار انسان تشكيل شده است. نكته ي قابل توجه ديگر در اين كتاب اين است كه در مورد اكثر اين ٩٩ مورد به تحقيقات روانشناسي و جامعه شناسي معتبري ارجاع داده شده است كه خواندن بسياري از آنها بديهيات ذهني انسان را تغيير مي دهد. مي توان با اطمينان تصور كرد نيمي از چيزهايي كه به خاطر داري اشتباه اند. خاطرات مابا بي دقتي هاي بسياري، از جمله خاطرات روشن كه بي خطا به نظر مي رسد آلوده شده اند، اعتماد كردن ما به آن هم مي تواند بي ضرر باشد و هم كشنده. خاطرات روشن محصول بازسازي ذهني اند و مي توانند كاملا خطا باشند. پ ن: اسم آقاي عادل فردوسي پور به عنوان مترجم در عنوان اين كتاب در رسيدن آن به چاپ چهل و ششم قطعا موثر است. پ ن: اميدوارم همه ي افرادي كه اين كتاب را با انگيزه هاي مختلف تهيه كرده اند آن را با تامل مطالعه كنند. اين اثر ارزش چند بار خواندن دارد. Absolutely In love with this books, I fulfils its title. A good way of reading it would be highlighting the clearest example in each fallacy in addition to the conclusion. I would say at the end sit down with a pen and paper and try to apply each to your life to consolidate the learning, make a list of all and in important decisions make sure they are error free. "Even highly intelligent people fall to the same cognitive traps. Likewise, errors are not randomly distri Absolutely In love with this books, I fulfils its title. A good way of reading it would be highlighting the clearest example in each fallacy in addition to the conclusion. I would say at the end sit down with a pen and paper and try to apply each to your life to consolidate the learning, make a list of all and in important decisions make sure they are error free. قبل از اينكه شروع به خوندنش كنم منتظر مواجهه با يك اثر علمى تَر و تخصصى تَر بودم. ولى كتاب اونقدرها هم علمى و تخصصى نيست و بيشتر از همه بر پايه تجارب اقتصادى و مربوط به تجارت و بازار كار قرار داره. در مجموع خوندنش با يك ديد انتقادى بد نيست.